For the last few months I have been working on this small zine for Electric Picnic. Myself and Luke decided to put together a collective of festival experiences as a retrospective. We outlined our ideas and initially the plan was for Luke to write a couple of articles and I would illustrate them with some of my photos and do up the layout. We would print 30 copies on my home printer and hand them out at Electric Picnic to friends. Our goal was to attempt to put our finger on the excitement and fun of festival-going, try to answer the question of why it’s so enjoyable and why we return year after year. We attempted to keep a lid on it but pretty soon people started hearing about the project and wanted to contribute. The next thing I knew I had seven writers, two illustrators, a comic artist and a photographer. I was on the phone to printers negotiating rates for printing. I was rapidly running out of space, cutting content, dropping things that didn’t make the grade and editing articles down. In the end, I managed to cram in some great festival experiences, cartoons, illustrations, photography and a few fun surprises. Originally we intended it to be a friends only kinda deal, but as more people contributed, the more sense it made to keep it accessible to everyone. Forgive us if you find the odd in-joke popping up here and there! 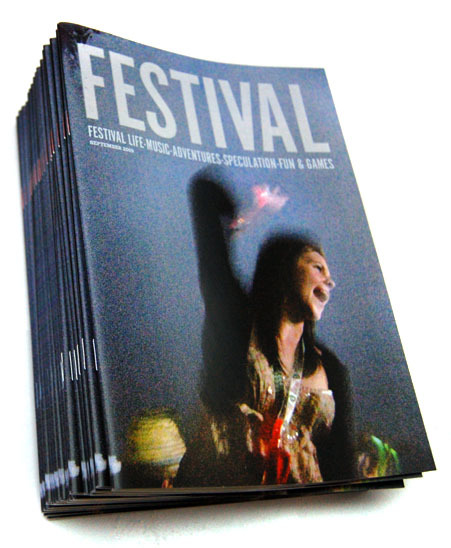 So after all the long months, the e-mails, all the hard work by everyone, I present the FESTIVAL zine, and, well, we hope you enjoy it. If you don’t we’ll give you your money back! Read the zine here or I have a few limited edition printed copies left that you can buy for 7 euros. Behind the scenes and making-of photos available at this flickr set. Set in Caslon 7pt, Headings set in AlternateGotNo1D, Chunk Five, and a little Coffee Service thrown in for good measure. Excellently printed and bound by Jaycee, Temple Bar. Limited to 50 hand-numbered copies. 32pp saddle stiched 140gsm gloss.